With clubs heading into a three match run without county players in the run up to the Derry/Down Ulster Championship clash, there is a familiar look to the Division one table with Slaughtneil and Ballinderry top on 10 points each from five games. Kilrea on eight and Ballinascreen on seven points are handily placed behind them but the shape of the table could have a different look with teams now having to play without county players for the next three games. Ballinascreen moved into the top four with a comprehensive nine point win over Banagher, the opening half bringing just five points as Ballinascreen took a 0-03 to 0-02 lead. Barry Grant, Shane Mulgrew and Brendan Herron opened up a three point lead but Banagher came back with a pointed Mark Lynch free and a point from play by Padhraic Murphy. Seven minutes into the second half Carlos McWilliams netted, Barry Grant and Shane Mulgrew then on target with a point each for 1-04 to 0-02. Shane Farren got Banagher’s third point but Anton Kelly hit back with a Ballinascreen point, Mark Lynch then pointing a free for 1-06 to 0-04. In the 50th minute Brendan Herron pointed, Shane Mulgrew wrapping up victory with a 55th minute goal. Glenullin lost two players to injury before the start, the O’Kane brothers, Gerard and John, unable to take their in the starting fifteen. However they had a very positive start when Ruairi Boylan put Paddy Bradley through for a 10th minute goal, the former also scoring two points in the first half as Ballinderry took a 0-07 to 1-02 lead to the break. Ruairi Boylan, Eoin Bradley and Dermot O’Kane from a free gave the Mitchel’s the lead 1-05 to 0-07 but Ballinderry picked off points freely to win by seven points, Dermot O’Kane from a free, Chrissy Dempsey 0-02, 0-01 free and Paddy Bradley free completing the Glenullin scoring. Bellaghy enjoyed their best win while Foreglen suffering their heaviest defeat of the season as they lost by 13 points to the Tones. Dominic McFaul scored the first of his two goals to take the home team to a 1-08 to 0-05 half time lead, Eoghan Brown and Declan Graffin contributing to their first half points’ tally. Bellaghy maintained their dominance in the second half with McFaul and Conan Brown finding the net to take them to a commanding victory, with Foreglen’s three second half points coming from Gavan McCormick and Ciaran McFeely (2). With just one win from five games Foreglen now find themselves in the bottom two, facing difficult games to come. Dungiven scored four unanswered points in the last eight minutes of the first half against the strong wind to come from 0-05 to 0-03 behind to lead 0-07 to 0-05 ahead at the short whistle. They added two points within two minutes of the resumption and then recovered from a 42nd minute Colm McGoldrick goal that tied the scores at 0-09 to 1-06 to again go two points ahead midway through the half. Fergal McGuigan scored 0-05, 0-3 from frees in the first half, Darrell O’Kane and Conor Murphy also on target. Colm McGoldrick (3) and Sean Leo McGoldrick (2) were the Coleraine scorers. 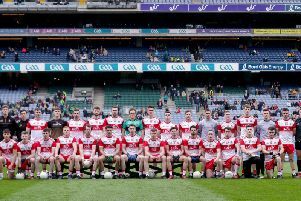 Both sides had chances to win the game after Sean Leo McGoldrick and Ruairi Leonard equalised with 10 minutes to go, Kevin Johnston penalised with the goal at his mercy, Sean Leo McGoldrick punting the ball wide in added time when it looked odds on a winning point from the 20m line. Aaron McCloskey and Niall Holly were black carded in the second half in a game of wasted chances from both sides.